The odd thing about this sign is that this spot, about a mile from the border of Sharon, is in Lakeville, and in Salisbury. Around here, there are towns, and there are villages within towns. 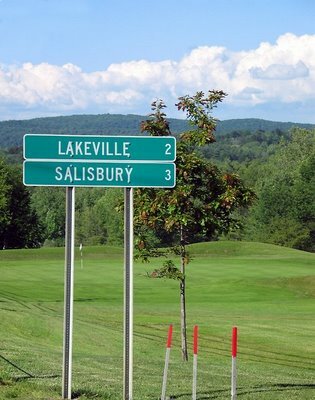 Salisbury is the town next to the town of Sharon, and within the town of Salisbury are the villages of Lakeville and Salisbury (which are 2 and 3 miles from this spot, on the grounds of Hotchkiss School.) 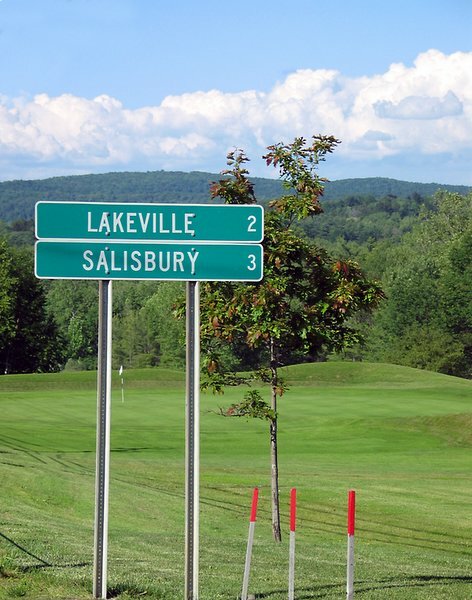 As I took this photo, I was standing in the town of Salisbury, but it was the part of Salisbury called Lakeville but not in the village of Lakeville... If you're confused, be glad you don't live in Falls Village, in the town of Canaan, which is completely separate from the village of Canaan, which is in the town of North Canaan! Sharon, on the other hand, is just a town, not a village. OK, Everybody got that straight? There will be at test tomorrow! Now I'm thoroughly confused. Kinda like who's on first, what's on second, etc. You totally lost me. Should i ever come over, I'll make sure to have a map! Some fun pictures since my last visit...I´ve been swamped with work...I love the bear on the tree, it´s so cute that it kind of looks fake!bravo! That's crazy. I'm completely confused.